Some things can bring out the child in almost anyone. For instance, Christmas surprises, a fairy tale with a happy ending, and a shiny, bright red fire engine. The El Cajon Professional Firefighters Foundation received a touching gift in April 2014. Meg Buxton donated her late husband’s prized but disabled 1950 El Cajon American LaFrance fire engine to the group. And the firefighter nonprofit is asking El Cajon neighbors and friends for help. The goal is to get the beautiful truck in running condition again this year. It is a shiny, bright red fire engine. Gil Buxton was a longtime East County businessman and community leader who served as president for the Mother Goose Parade. A sheet metal worker by trade, he had a passion for rebuilding classic cars. And Buxton had lovingly restored the original 1950 El Cajon Fire Department firefighting engine, purchased from an acquaintance in 2002. He rebuilt most of the American LaFrance truck, down to its Lincoln flathead twin V12 engine and its dual stage centrifugal fire pump, first driving the refurbished fire engine in the 2005 Mother Goose Parade, and then again in the 2006 parade. But somewhere along the road, the engine’s radiator failed, which in turn damaged the motor, rendering the vehicle inoperable. The fire engine sat idle for a time, as Gil Buxton battled illness. Pancreatic cancer took him from his family and the community a little over three years ago. And by mid-2014, the El Cajon Professional Firefighters Foundation had taken possession of his donated fire engine. The truck is now stored in the underground garage at the El Cajon Police Department building, its motor compartment empty, awaiting a replacement motor. 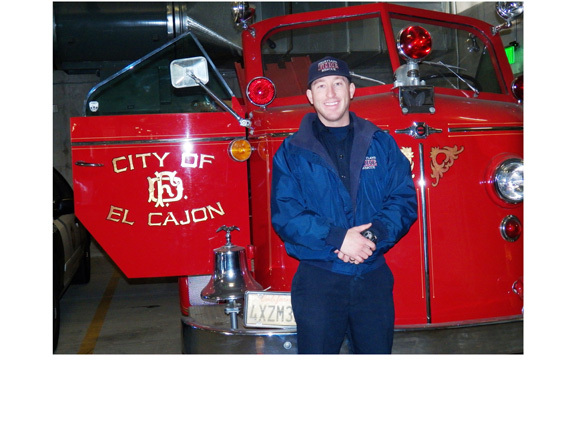 Ryan Abell, an East County firefighter-paramedic for six years, is on the El Cajon firefighter foundation board, and assisted with logistics and coordination in towing and transferring the donated Buxton fire engine around to where it sits today. Abell is now furthering his mission, overseeing the fire engine’s restoration and collecting information on the truck’s history. Abell explained what the project is all about. The El Cajon Professional Firefighters Foundation was established as a 501(c) 3 organization three years back, in order to facilitate support for local charitable efforts. As much as they do in their work at Heartland Fire & Rescue, these firefighters still want to do more. Charities the group has helped include the Burn Institute, the Make-A-Wish Foundation, Octoberstache, and the Challenged Athletes Foundation. The restored El Cajon fire engine will play a key part in the foundation’s expanded charitable and community service outreach. After all, who can resist admiring a beautiful fire engine? Not the retired firefighters who are donating their labor, free of charge, to repair damage to the vehicle. And certainly, not the East County residents who might get a chance to view the restored classic fire truck at parades and local events. Although the history of the American LaFrance fire engine is still sketchy, Abell has learned that the truck arrived at the ECFD on June 7, 1950. He has been unable to discover where it resided after its retirement from service. He believes the vehicle was sold at auction sometime during the 1970’s. Recently, Abell and his associates began requesting donations for the fire engine restoration project. They had paid out $5,200 from its funds already, as 2015 was ending. The bulk of that money went for purchase of a replicated motor, which was found at Andy Swift’s Firefly Restoration in Hope, Maine. “It’s an exact match to the original motor,” Abell said. That replacement reached El Cajon in November. Will there be a storybook ending for this shiny, bright red fire engine? Abell estimated the amount of dollars needed to finish the project at $9,800. His group has offered to provide special acknowledgment to anyone giving $1,000 or more, with an engraved plaque noting the contribution to be permanently affixed to the fire engine. Abell singled out for mention both to Dwight Brinkerhoff of Horizon Automotive in Lakeside and to Kirk’s Radiator at the borderline between Santee and El Cajon. These two auto repair shops have given important assistance and donation of time to the project to date. Besides paying for the ongoing repairs, contributions for the fire engine will go toward maintenance, insurance, fuel and routine vehicle care. All donations are tax deductible, and any financial aid can be sent by check, payable to El Cajon Professional Firefighters Foundation, addressed to 100 E. Lexington Avenue, El Cajon, CA 92020. Ryan Abell can be contacted for more information about the project at Rabell@HeartlandFire.net or at (619) 247-6139. Heartland Fire & Rescue serves the East County communities of El Cajon, La Mesa and Lemon Grove.